What Day Of The Week Was January 15? 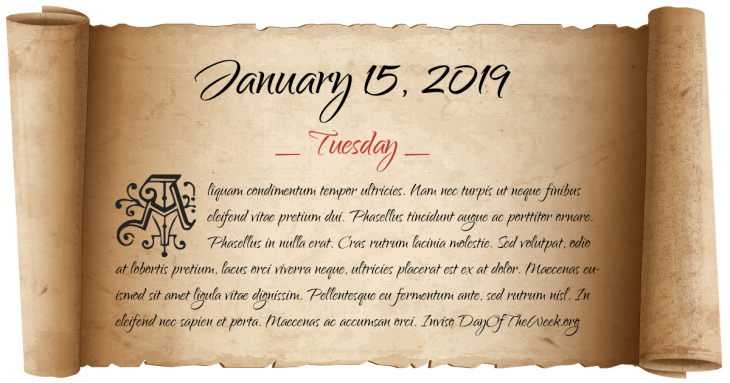 January 15, 2019 was the 15th day of the year 2019 in the Gregorian calendar. There were 350 days remaining until the end of the year. The day of the week was Tuesday. Gerald Ford’s would-be assassin, Sara Jane Moore, is sentenced to life in prison. The Living Seas opens at EPCOT Center in Walt Disney World, Florida. Elizabeth II, in her capacity as Queen of Australia, signs letters patent allowing Australia to become the first Commonwealth Realm to institute its own separate Victoria Cross award in its own honours system. Who were born on January 15?